Today I am sharing royal falooda recipe. Falooda is one the best layered dessert in a glass that has its origins in Iran. This multi-textured summer drink has made its entry into many countries like India, Pakistan, Middle East, Bangladesh, Myanmar (Burma) and Turkey. The Parses who migrated to India from Iran introduced this sweet concoction to the Indian people. It is an integral part of the menus of street food hawkers that sell drinks, ice cream parlours and restaurants which serve numerous variations to the basic falooda recipe. The basic falooda recipe, a milk based dessert, has rose syrup, falooda sev or vermicelli made from arrowroot or corn flour, milk, falooda seeds (basil seeds) and ice cream going into it. Indian falooda recipe has evolved into various flavours like saffron, pista, mango, strawberry, chocolate, rabri etc. 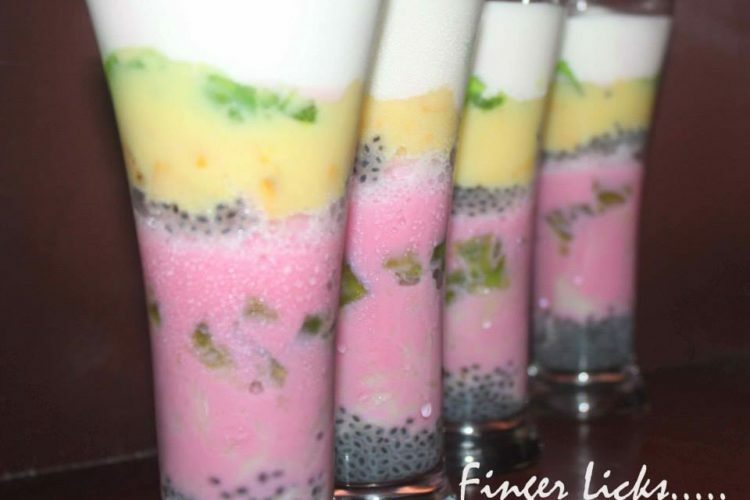 Fruit falooda is also very popular where the royal falooda recipe is layered with fresh cut fruits.. The best thing about this recipe is we can pre prepare all the ingredients and refrigerate it. Just mix everything and serve chilled whenever required & it tastes fantastic!! Falooda drink or milkshake is truly a delightful summer dessert that is addictive. Every sip is luscious and truly a taste of heaven! Cook the falooda seva/vermicelli in milk and sugar till cooked. Keep aside to cool. Then chill in refrigerator till needed. Put the the basil seeds in a bowl and pour enough water over them to completely submerge. They will soon start to swell and look transparent with a small dot-like black centre! Strain and keep aside in a small bowl. Soak china grass in water for 10 minutes. Melt it on low flame. Add required amount of sugar and green food colour. mix well. Pour this to a tray. Keep it aside to set well. (instead of this you can use any of your favourite jelly). Put the milk, sugar,strawberry syrup/rose essence as per your choice in a blender and blend till smooth. Chill in the refrigerator. Prepare vanilla custard using custard powder,milk and sugar. Frost tall glasses. In each glass, first put 1 tbspn of soaked basil seeds. Then put some cooked falooda seva/vermicelli. Now pour chilled strawberry/rose milk over them. put little coloured china grass mix/jelly on it. Put some more basil seeds on it. Add some chopped fruits along with vanilla custard. Then add some more china grass mix/jelly on it. Add a large scoop of ice cream to this and drizzle with some more rose syrup. Garnish with chopped nuts and cherries. Add a long-handled spoon and serve immediately.